The Viking Jupiter is a comfortable, intimate and thoughtfully created ship that will take you around the Mediterranean, to the Norwegian Fjords and across the Atlantic. 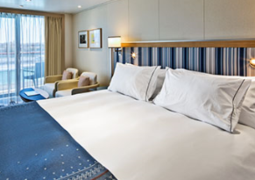 All of Viking Jupiter's cabins are equipped with a balcony. Choose the clean-cut Veranda Cabin or go for an extra spacious Explorer Suite, filled with special perks and amenities. 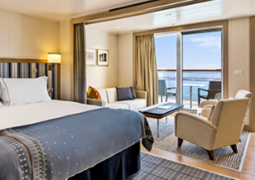 No matter which cabin you decide to go for, it is sure to be elegantly designed in true Viking Cruises fashion. Choose one of three onboard restaurants, all at no additional charge. The Restaurant offers an ever-changing menu, reflecting local cuisine and sourcing local produce. Manfredi's offers the best of Italian cuisine, be it farm-inspired heartiness of Tuscany or the famed flavours from Rome. The Chef's Table will create the perfect pairing of food and wine at your request. Destination Performances of the most iconic cultural performing art of the region; Viking Resident Musicians playing relaxing classical music; Destination Insights and Port Talks are just some of the things awaiting you on board the Viking Jupiter. If retail therapy is a priority, look no further, as there are a number of shops on board. Viking Jupiter features a Nordic inspired Spa and Wellness Centre - the perfect backdrop for rest and relaxation. Guests are welcome to use the Sauna and the innovative Snow Grotto. There is also a fitness centre and salon on board, ensuring passengers look and feel their best at all times.